This map details Insurance zones throughout the world where you can buy a single policy to insure your vehicle for Overland travel across multiple countries. Europe – Green Card, South America – MERCOSUR, East Africa – COMESA, West Africa – ECOWAS. This is insurance that you would normally buy in your country of residence.This can only be purchased for EU registered vehicles. Insurance purchased in any European Union (EU) country should cover you for all EU states at the minimum required level without paying more or restrictions. 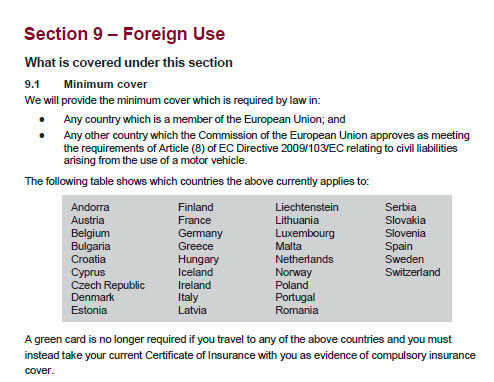 There is normally small print that says something like “your insurance will only cover you for 90 days at the same level in other EU states” this means if you have fully comp or extras, they will only be covered for 90 days, but the basic legal limit (third party) will apply as long as the insurance is valid. This insurance can cover both EU and foreign vehicles and can be purchased in advance online via insurance brokers like Tourinsure or Alessie or at the borders. This insurance would normally cover only countries which are in the European Union. Green card insurance can be arranged through your current EU insurer, or through a an insurer listed on the Cobx website. Although green card insurance can cover many other countries, this is not automatic and you do need to ask / confirm which countries you require coverage for. Green Card insurance in most instances (unless provided FOC) is more expensive than local insurance purchased on the border, unless you are just travelling through for a couple of days. In some instances your current EU insurer may provide Green Card insurance for free. In South America it is possible to obtain MERCOSUR insurance that would normally cover Chile, Argentina, Paraguay, Uruguay, and Brazil. However if you ask, it is sometimes possible to include other associated countries like Bolivia & Peru. You can purchase MERCOSUR from Magallanes, [email protected], integrityseguros.com.ar, atmseguros.com, Allianz or Klaus & Claudia Schubert ( [email protected]). For other countries you would obtain third party insurance on entry. In 2015 Ecuador introduced a new state sponsored vehicle insurance. During the transition period it was not possible or required to obtain insurance. Dec 2015, Insurance was not required for foreign vehicles, nor could it be purchased at the border. You can obtain insurance at most borders in Central America. Insurance is not required in Guatemala. Canada & USA – Most insurers will insure both the USA and Canada and sometimes Mexico. To obtain insurance you normally require an address in the country, this could be a friends place or a hotel etc. 2017 Update: Most overlanders are having difficulty obtaining insurance in North America, however you can try the following insurers. Note the country you ship into i,e Canada or the US may affect which insurers will cover you, also the age and type of vehicle. East Africa – COMESA, Yellow Card – Burundi, Djibouti, Egypt, Eritrea, Ethiopia, Kenya, Malawi, Rwanda, South Sudan, Sudan, Tanzania, Uganda, Zambia, Zimbabwe. Yellow card insurance can normally be purchased on the border. *Note Egypt has been known not to accept COEMSA at the border. West Africa – ECOWAS – Brown Card – Benin, Burkina Faso, Gambia, Ghana, Guinea, Guinea-Bissau, Ivory Coast, Liberia, Mali, Niger, Nigeria, Senegal, Sierra Leone, Togo. *When purchasing any of the above you must specify which countries you will be visiting. Middle East – Tour insure from Hambrug can provide coverage for (UAE, Oman, KSA) and all countries in Africa. Iran – In Iran you can buy third party insurance at the border (Bazargan) at Iran Insurance, just before you leave the customs area. You may also be able to obtain green card insurance to cover you through Iran. Armenia – third party liability insurance is mandatory when importing a car. You are directed towards an insurer just before you leave the customs area at Agarak. (Iran-Armenia border). We paid 13.000 dram for a month. Very straightforward and cheap. for example in NSW CTP foreign vehicles do not require Compulsory Third Party (CTP) insurance (green slip). In the case of an accident, a NSW third party personal injury claim involving a visiting overseas vehicle is made against the Nominal Defendant Scheme, administered by the State Insurance Regulatory Authority. When we arrived in QLD we were required to purchase CTP insurance as part of our vehcile registration. If you are travelling in Australia, it advisable to take out insurance that covers you throughout the country. New Zealand – Vehicle insurance is not compulsory in New Zealand but it is recommended. You can purchase this from Covi Insurance or Campercare. It is possible to obtain specialist insurance that would cover specific regions like, Asia, Africa, Central & South America, although it may be more expensive than obtaining insurance locally or at the border. One company that can provide such insurance is Alessie & Tour Insure (Hamburg). *Note European Union (EU) is not the same as the continent of Europe, and some countries in “Europe” are not part of the European Union (EU). *Always read your insurance policy, the T&C’s and coverage, so you know what is and what is not covered, if in doubt contact your insurer. That is the case (the second part of the sentence) in WA where the compulsory liability insurance is provided in a bundle with your registration fees. These vehicles do not require Compulsory Third Party (CTP) insurance (green slip). In the case of an accident, a NSW third party personal injury claim involving a visiting overseas vehicle is made against the Nominal Defendant Scheme, administered by the State Insurance Regulatory Authority. A lot of european insurance companies ad some of the neighbouring green countries in their standard “blue” zone. Sometimes they add countries for free i you just ask. Unfortunately, we are no longer offering the border insurance (Green Card insurance). We stopped this business on 30.06.2017. May be they might help to get a Green card insurance.